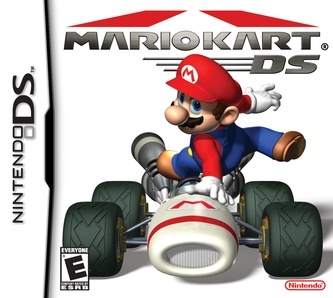 Developed by: Nintendo Published by: Nintendo Release Year: 2005 ESRB Rating: Everyone For: Nintendo DS *Time to race...no wires attached. The acclaimed Mario Kart series has gone wireless, letting players race and battle with up to eight karts at once, regardless of whether everyone has a game card. An all-star cast that includes Mario, Luigi, Peach, Yoshi?, Donkey Kong, Wario, Bowser and Toad will round out a truly all-star lineup of more than 30 courses drawn from every Mario Kart game. That\'s right ? players will tour courses from Super Mario Kart, Mario Kart 64, Mario Kart: Super Circuit and Mario Kart: Double Dash! !, not to mention brand-new tracks and arenas. With all the crazy items and frantic speed players have come to expect, this game is a Mario Kart fan\'s dream. The game has a new dimension of fun, since players can battle others around the world by connecting to Nintendo\'s new wireless gaming service, Nintendo Wi-Fi Connection, via Wi-Fi. * * From IGN.com Mario Kart DS is the fifth game in the long running Mario Kart series from Nintendo. Super Mario Kart for SNES started the series off with a bang when it showed that the modest graphical abilities of the SNES could be put to good use and create such a fun game. Then came Mario Kart 64. It was a big leap in graphics but it never seemed to match the charm of the original, it might even be because the graphics were much better and not as cartoony. Even though it didn\'t acheive as much acclaim as the original, it still did very well and was an extremely fun game to play. Then the gameboy advance version came out: Mario Kart Super Circuit. It was more of a revisit to the classic gameplay of Super Mario Kart and it was a smart move by Nintendo. It was probably the most anticipated game for the GBA and it definitely was not a letdown. Riding on the Mario Kart success wave, Nintendo thought it would change things up a bit and released Mario Kart: Double Dash!! for the GameCube. It was sort of a mixed bag. On the one hand it was incredibly fun to play with the new options (such as having two people on the same kart) but it also seemed like it wasn\'t very deep with few unlockables and an underwhelming battle mode. Then Mario Kart DS came along and peaked almost everyone\'s interest. It was a mixture of classic control and new graphics and Nintendo sure got it right! The graphics in this game are certainly not mind-blowing, but they are suitable for a game like this and most importantly of all: they are perfectly smooth. Not once have I noticed a frame-skip or "choppiness" throughout my entire single player experience. The multiplayer has some lag, but that is just due to bad connections and not the graphic engine. The courses for the original tracks for Mario Kart DS are very well done, with tracks spanning from inside (and outside) Luigi\'s Mansion, to a highway course where you are up against traffic. The lack of texture filtering can be disappointing at times, but that\'s due to the limitations of the DS and the necessity to keep the frame rate so high. The Retro Circuit (with tracks spanning all previous Mario Kart games) are a mixed bag. It all depends on the track. The SNES tracks have been "3D-fied" a little, but are all flat and a little monotonous. The Nintendo 64 tracks are looking better but lack a good draw distance. The GBA tracks look solid, albeit a little monotonous also, but the GameCube tracks look great on the DS and the draw distance at times is amazing considering the DS\'s graphical limitations. When it comes to sound, Mario Kart DS is top-notch. You definitely want to crank the volume up for this game. The sound effects for the karts and weapons are spot-on perfect and the music blends in perfectly with the theme of the game. I especially love the sound of the red homing shell when it\'s locked on to an enemy kart. The only problems with the sound are the repetitive "voice acting" that occurs when ever you pass someone or hit them with a weapon. It\'s usually nothing more than a grunt or other strange noise, but sometimes seems a little unnecessary. Overall, very well done. I have not encountered any bugs during my experience with this game. The WiFi connection can be a little unstable (laggy) but again, that is not because of the game, it\'s only because of wireless connections and the various problems that can occur from them. Wow. Perfect. Nintendo has taken the highly praised control mechanics from the previous titles and tweaked them so they are absolutely perfect to play through the game with. I love the drifting in this game, and also I\'m glad they brought back the ability to bounce around corners or to alter direction. The only complaint I\'ve heard or read about the controls is that the accelerator and brake buttons are too close together. I never once thought that to myself while I played the game, but it may bother some people, especially since the controls cannot be re-mapped. The interface is also perfect, the menus are highly accessable, the touch screen is (thankfully) not used for anything more than a map, which is extremely useful when planting banana peels or staying on the road when your screen is covered in ink (one of the new weapons). Excellent. The only violent content in this game would be the idea of shooting turtle shells at people or trying to slip them up with explosive boxes or banana peels. The only effect these items have on the other players is a complete stop of their kart or a little delay while they spin around. Even the battle mode only carries the effects of losing a balloon when you are hit. With the characters only making indistinct sounds and the inability to chat while playing online, there is no possibility for harsh or foul language, which is a major plus. As with all Mario Kart games (and really all Mario games) there is no sexual content to speak of in this game. The only thing that I have noticed was that someone drew a part of the male anatomy as their emblem during online play, but that wasn\'t part of the game only the immaturity of one player. There is no magic in the game at all or any occultic images. I hate to take a point off but one of the tracks (Luigi\'s Mansion) takes a stroll through a graveyard where there are classic Mario ghosts floating around and the trees use their roots as legs and walk from side to side. I REALLY hope no one would be offended by that but I had to put it in here just to be completely sure. There\'s nothing to worry about in this category as there are no authority figures present and it\'s all presented in a friendly and cheery way as the previous titles were.